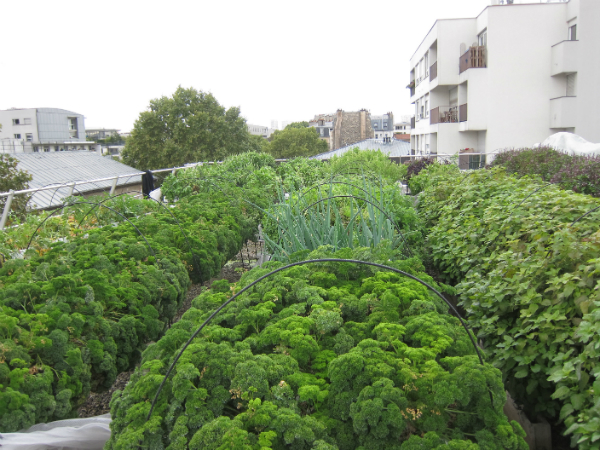 Paris has taken the farm out of the field and planted parts of it onto its rooftops to make the city greener and more sustainable. This summer, metro operator RATP became one of the first companies to host a commercial farm on one of its roofs. A sudden breeze carrying gentle notes of basil and mint envelops pedestrians walking by the RATP building at Place Lachambeaudie in the 12th arrondissement, a middle-class district located in the east of the French capital. Some passersby quickly lift their noses to try to figure out exactly where the fresh and appetising scents are coming from, but none seem able to locate the origin. The scents are coming from the top of the grey and arch-shaped office building where Michel Desportes and Théo Manesse have been spending the better part of the afternoon harvesting row upon row of various types of organically-grown herbs ranging from violet-coloured basil to chocolate-and-banana-flavoured mint. “It’s growing so much at the moment that we have to harvest every day,” Desportes, one of the founders of the start-up Aéromate which runs the farm, tells FRANCE 24. Bees and ladybugs constantly buzz around the plants, seemingly oblivious to the traffic and pollution on the streets down below. The farm was started in July this year after a 2016 call by the City of Paris for a series of urban agriculture projects to make the city more environmentally sustainable. By 2020, Paris aims to have transformed 33 hectares, or 330,000 square metres, of its unused urban space into urban agriculture. Although the commercial Lachambeaudie farm, which sprawls over a 450 square metre area and houses up to 5,000 plants, mainly focuses on growing fresh herbs, it also offers some seasonal fruits and vegetables. At the moment, this includes several different species of tomatoes, zucchini, peppers and lettuce. This winter, Aéromate plans to cultivate crops like watercress, spinach, cabbage, Brussels sprouts and artichoke. Everything is grown hydroponically, a hydroculture method developed by the Inca and Aztec Indians and in which the plants are grown without any soil by using only mineral nutrient solutions in water solvent. The decision by RATP to install and invest in the farm is part of its corporate mission to contribute to a more sustainable Paris. The group, which owns several buildings in the city, has identified 1.4 hectares (14,000 square meters) that it plans to transform into cultivated grounds by 2020. Aéromate is currently setting up a 180-square-metre farm, also on the roof of real estate group Tishman Speyer, at Place de la Bourse in central Paris, and is planning for a third commissioned by the City of Paris at the nearby Place de la République. Aside from selling the herbs and produce to staff of the companies that own the buildings, Aéromate also offers its harvest on online platforms such as “La Ruche qui dit oui!”, which connects local producers with consumers directly. Aéromate has also begun doing business with local restaurants and bars, of which two of its current customers are Michelin-starred eateries. As the business grows, Aéromate expects to harvest up to 31 tons of herbs, fruits and vegetables each year. “It feels good to work up here. I feel lucky to be surrounded by all these green plants while actually working in the centre of the city,” Desportes says.